3 Protein-Packed Breakfasts to Kickstart Your Day | Valet. Eating breakfast every morning is important, but what you choose to eat is likely even more important. If you want to prevent spikes in hunger pangs and stabilize your metabolism while starving off prevent weight gain, you need to make protein a big part of your day's first meal. According to a recent University of Missouri study, participants who ate a breakfast containing 35g of protein reduced their daily food intake by 400 calories and lost body fat mass. Thankfully, it's not hard to boost your morning protein intake. Herewith, three to try. 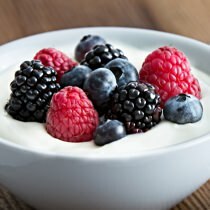 Wellness chef and author Candice Kumai recommends starting your day with a bowl of fat-free Greek-style yogurt topped with a serving of fresh berries. Feel free to top it with a little honey and nuts. It might feel more like a dessert, but a small bowl will fuel your body with more than 20 grams of protein along with a boost of calcium, iron and plenty of antioxidants and nutrients from the berries. You don't have to go full-on Paleo to enjoy the low-carb, high-protein benefits of the breakfast bowl. 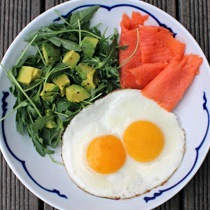 While your eggs are cooking, assemble some fresh greens, a little avocado and top it with a slice of smoked salmon. Rich in good fats and plenty of flavor, this feels more like an indulgent brunch meal than a healthy (and quick) weekday breakfast. A frittata, the Italian baked egg dish, makes for a hearty and nutritious breakfast that can be made the night before and then reheated the next morning. 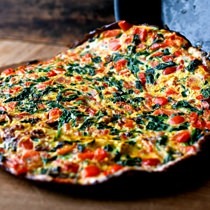 If you don't have a lot of time before heading out, this spinach and red pepper frittata is a great recipe. Classic Mediterranean ingredients like peppers, onion and spinach bring texture, flavor (and plenty of vitamins and protein). These will make you want breakfast for dinner.